Oh Amsterdam! what a beautiful city you are, we can’t quite work out why you aren’t shouted about more often! We are big lovers of train travel and will pick the train over a plane any day! So when the Eurostar started offering direct trains to Amsterdam we quickly booked ourselves a mid -January/ ‘beat the January blues’ getaway. And while this was actually our second visit to the city of freedom (our first being on a whirlwind Summer tour a few years ago) it was by far our favourite, and we would heartily recommend a trip to this pretty city in any season. 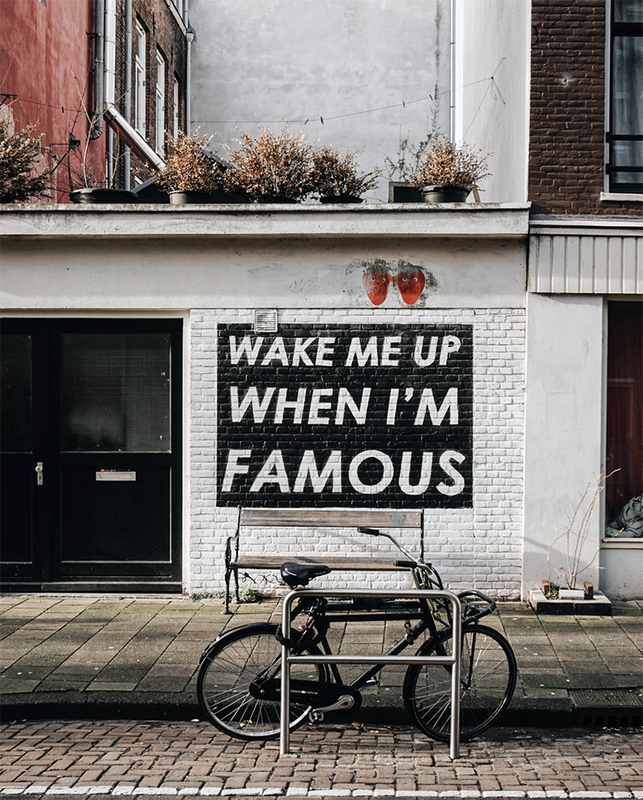 Amsterdam is often over-looked as a party heavy destination, all red light district and coffeeshops, but step away from the main tourist centre and you will find a cool neighbourhood vibe with as many cosy brunch cafes and design boutiques as you could possibly want. 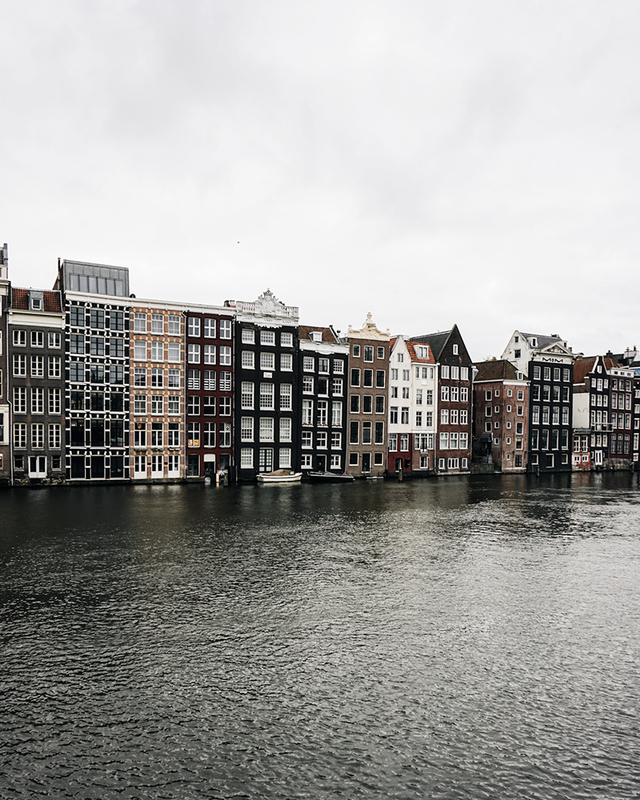 Not to mention endless photographic canals to wander and Dutch architecture to marvel at. Those insta-cute dancing houses really do stretch for miles and the city is so pretty and relaxing we wanted to plan your next trip back even before we left. By far our favourite neighbourhood was the Jordaan district. In fact this is where we would love to live if we became Amsterdam locals. While we wouldn’t recommend the hotel we stayed in here (lets just say “paper thin walls”) there are a few hotels around and some lovely AirBnBs too. If your bank account can swing it check out The Pulitzer. Alternatively The Hoxton Hotels are always very cool. Take a Canal Tour - we organised a small group canal tour through our hotel with a man named “Captain Dave”, who was friendly and entertaining (and his boat came with heated seat cushions). Its great to see the city from another angle and learn some interesting facts along the way. We recommend booking something smaller than the huge tourist boats. Shop in the 9 streets - The cutest shopping district, the photographic '9 streets‘ were filled with clothing, design and vintage stores as well as bars, cafes and restaurants. They also just happen to weave around the best looking canals. 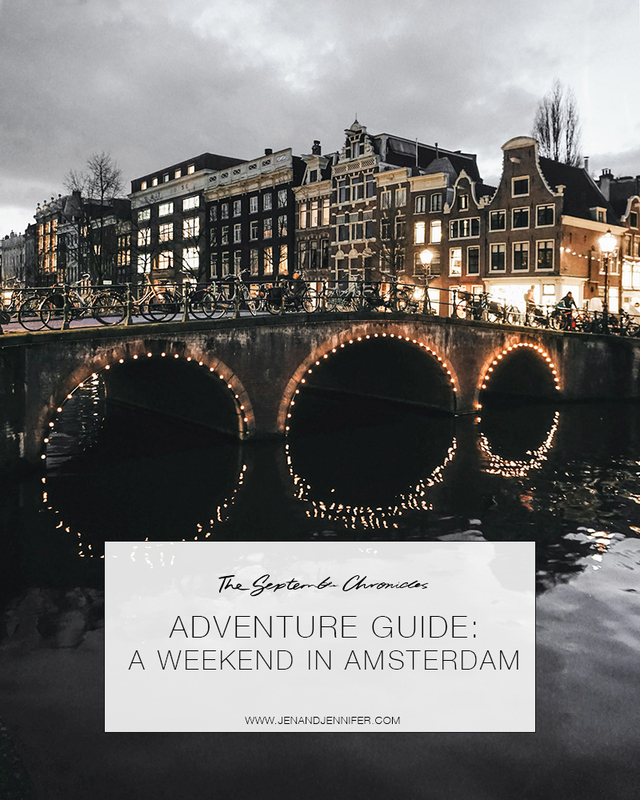 Visit some of the 75 Museums - we only visited the Rijksmuseum on this trip (after being spoilt with free museums here in London the 20 euro entry fee stung) but we loved our visit, especially the 2nd floor renaissance paintings and the grand library. TIP: Either plan your visit before 10am or after 3pm to avoid peak times. 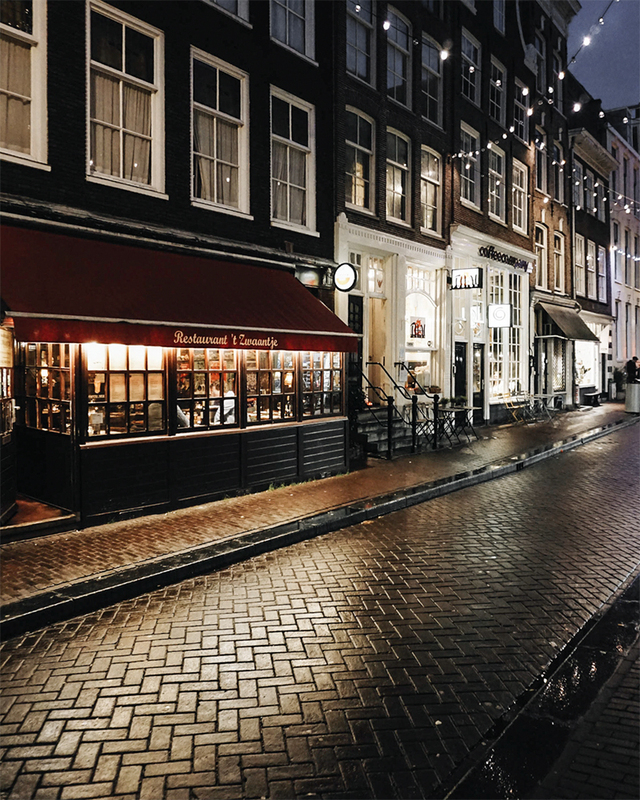 Explore the Jordaan Neighbourhood - If you aren’t staying here then definitely make some time to wander the picturesque strees. 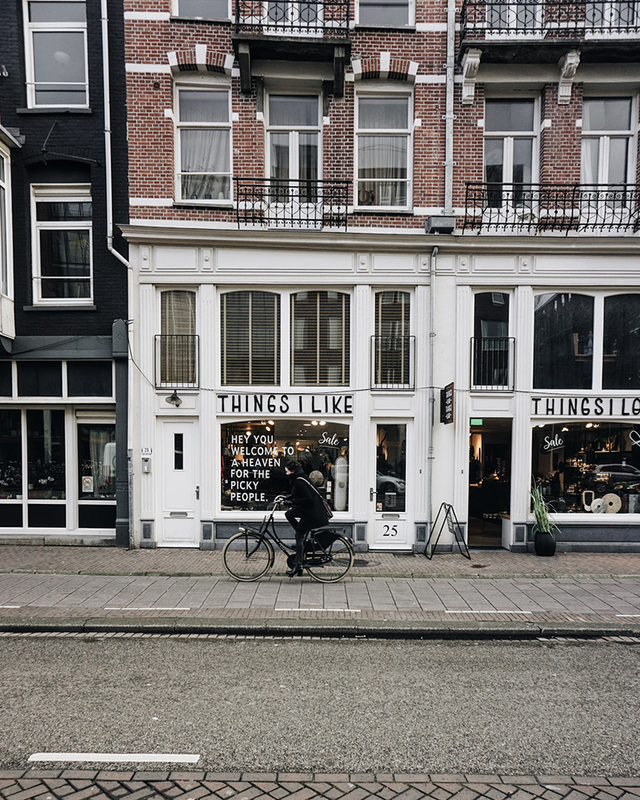 Explore the De Pijp Neighbourhood - the up and coming area with plenty of cafes and design stores to make the journey east worth it. After just returning from New York, Amsterdam food was impressively well priced, good looking, and most importantly delicious! Foodies rejoice, theres plenty on offer here to make even the fussiest of eaters happy. Toki Cafe - (card only) Good coffee and cakes , ridiculously on trend design. 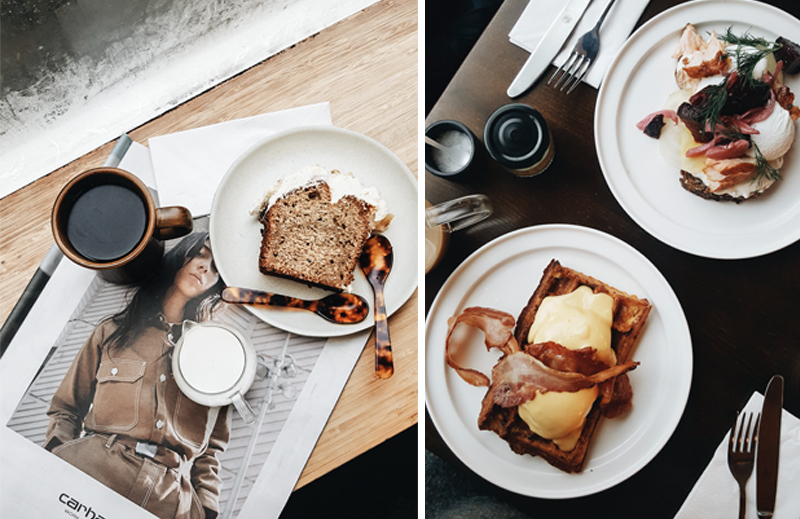 Anywhere you can get your hands on some Stoopwaffels - because yum. We also heard good things about : Venus & Adonis, Japanese Pancake world, The Butcher, The Duchess, Restaurant Jansz and Dignita. 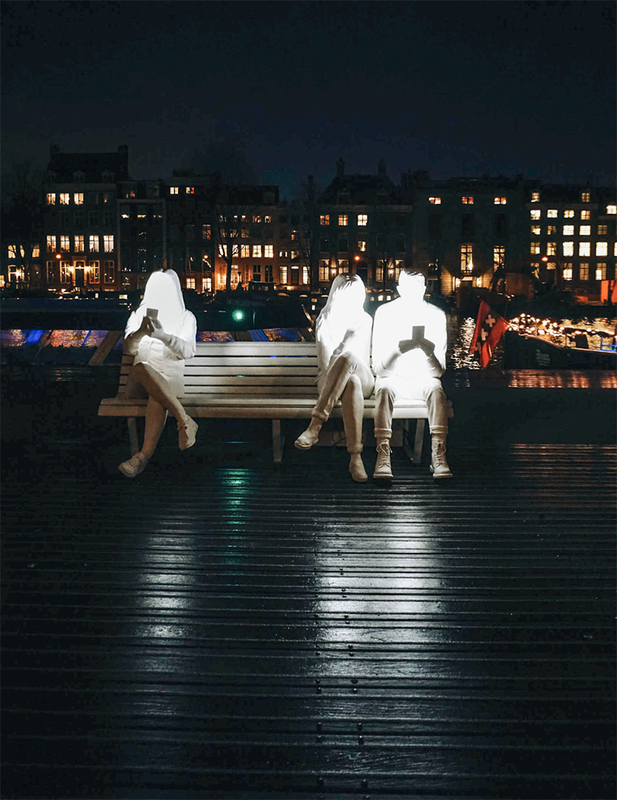 To be honest we think Amsterdam would be wonderful at any time of the year! Of course Summer is when the city is alive with greenery and sunshine and outdoor drinking sessions, but its also alive with tourists. 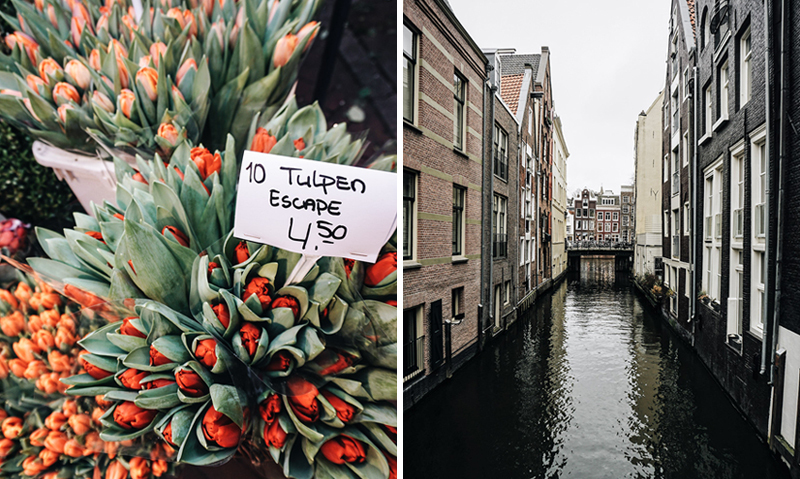 Spring and Autumn would be still be beautiful and slightly quieter (you could also do a day trip to the Tulip fields if you visit in Spring). And while winter can be rainy and unpredictable weather-wise, it is the best time to visit if you want a little peace and quiet. Plus all the sparkling lights and cosy cafes will soon chase away the cold. Christmas time would be magic. The Netherlands is in the Euro zone and uses the standard 2 pin euro plug. Amsterdam is a very walkable city (just watch out for the bikes as they have right of way! ), but you can easily hire a bike or take the trams and buses too. Just be aware theres no cash accepted, you can by tickets on board or at the machines using card -choose a fare valid either for 1 hour or 24hours. A lot of cafes and shops were also card only so be prepared to hand over your plastic. The red light district is…well its iconic, and I guess you have to see it for yourself, but its our least favourite part of the city. The main area is always busy, its full of chain stores and kebab shops as well as seedy looking bars and suspicious characters. And of course all the rest that you’d expect too. Take a visit and least once and you be the judge. Have you been to Amsterdam? We’d love to hear your tips and suggestions for our inevitable return trip! Send us a note in the comments.